Well, sort of a demo version. It's complicated. Toxikk, or TOXIKK, or We Had a Spare K Lying Around, and I'll Be Damned If I'm Going to Waste It, is an old-fashioned FPS that wants you to "frag like it's 1999". 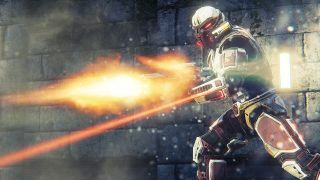 Appealing to folks turned off by cinematic shooters, more realistic character physics, and RPG-style levelling systems, it's instead an arena FPS just like mama, or indeed mama's parent company Epic, used to make. And it's out very soon indeed. It's just been announced that Toxikk will release next month, on September 9. The multiplayer-focused FPS is already out in early access, of course, but you've gotta hit version 1.0 sometime. The release will coincide with a free version of the game, a version that at one time might have been called a demo. It's not being called a demo here because Valve has specific restrictions for those: "people who play a demo on Steam cannot play online against people who own the full game", according to developer Reakktor. Demo or not, it will let you play the game for free, with no microtransactions (which Reakktor has a "deep antipathy" against) to worry about. It's not clear what the demo restrictions will be, or what content it will lack, but Reakktor say that the free version "comes with the full core experience, has no competitive disadvantages versus the FULL GAME and lets you play TOXIKK for free for as long and often as you like". You can find Toxikk here.